When the first iMac was released, the color of the translucent jellybean-shaped Mac was called Bondi Blue. Arriving at Bondi Beach, I could instantly see why Apple called it that. The color really looked like the original iMac! Uncle Clement took us to lunch over at Bondi Icebergs, a North Italian restaurant just overlooking the beach. He has been the perfect host for us during this trip. Traveling to foreign countries is really great when you have a local guide around to show you the sights and sounds! 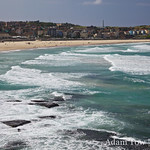 Here are photos from Bondi Beach in Australia.